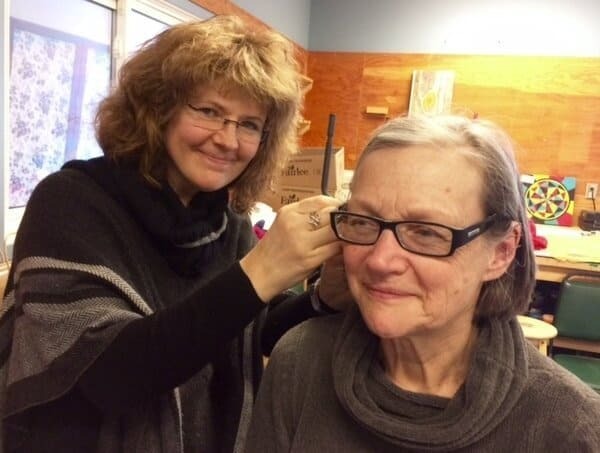 Reducing anxiety and stress, improving sleep patterns and assisting with smoking cessation are just some of the many benefits acupuncture therapy is providing to clients at the Community Connections Recovery Program on Montreal Street. The complementary therapy, which is offered by Occupational Therapist & Acupuncture Detoxification Specialist Adriana Farcas, is designed to provide additional support to individuals who are receiving mental health services from Providence Care’s hospital or community programs. The treatment Farcas provides is called Acudetox. It involves a simple, acupuncture modality in which small, stainless-steel disposable needles are inserted within various points of a person’s ears. Generally newer clients receive needles in only two acupuncture points (both ears) but as the treatments progress, they can receive as many as five. The process is quick and painless and once the needles are inserted, clients sit in quiet meditation together for about 45 minutes. Acudetox supports a person’s treatment and recovery process by promoting balance, relaxation, awareness and insight. The ancient alternative therapy has been shown to significantly assist people in their recovery from trauma, drug and alcohol addiction and other mental-health issues. The free service is offered at Community Connections at 533 Montreal Street on Mondays at 1 p.m. and is open to all Providence Care clients. For more information on programs offered at Community Connections or to learn more about Acudetox, contact 613-540-6166. This is soooooo amazing !! !